Shreya Tripathi Bhardwaj attended University of Pennsylvania Law School and received a Masters in Law Degree in 2010. Following law school, she practiced as an attorney with Binder and Binder and Freedom Disability, where she focused on Social Security Disability claims. As a litigator, Ms. Bhardwaj represented approximately 400 claimants in their claims for Social Security Disability benefits. She now focuses on Social Security Federal Court Appeals for the Eastern and Middle Districts of Pennsylvania. 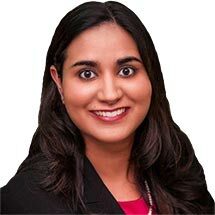 Ms. Bhardwaj is a member of the New York State and Pennsylvania bars.